Good news on the lights I got a call from the City first thing this morning and they are looking into the lights, saved me a phone call ringing them today, seriously great to see a proactive response. Just leaves me to call the cops and see if they are aware of the anti-social issues after dark. For I don’t know how many times, I walked into a dark Kings Square tonight, no street lights on, the place in complete darkness. The night activity was in full swing drunks and/or druggies screaming and yelling abuse, throwing things around. It is more noticeable # worse when the place is darkness, the anti-social behaviour just ramps up. I spotted that both ranger and council security cars where around at Kings Sq about the same time. Not that it seemed to make any difference? How is it that a simple issue like street lights, right in front of the councils front doors are such a challenge, its even worse now the library closes early, there is clearly no real interest in activation or even public safety for this area? I also noticed today that the Council chambers upstairs are getting a new paint job, I guess that’s not a good sign when a council is repainting a building they are supposedly knocking down in the very near future, does that mean Kings Sq plan B is not on track? The frequently much promised start date of kings sq, “soon to be announced”, is well and truly overdue, maybe Brad is looking for lessees while he cycles around Europe on his rate pater funded junket? Good news I hear that the Heirloom project has hit their sales mark and work could start in just days. Even better they don’t need the rate payers $3million to kick it off? 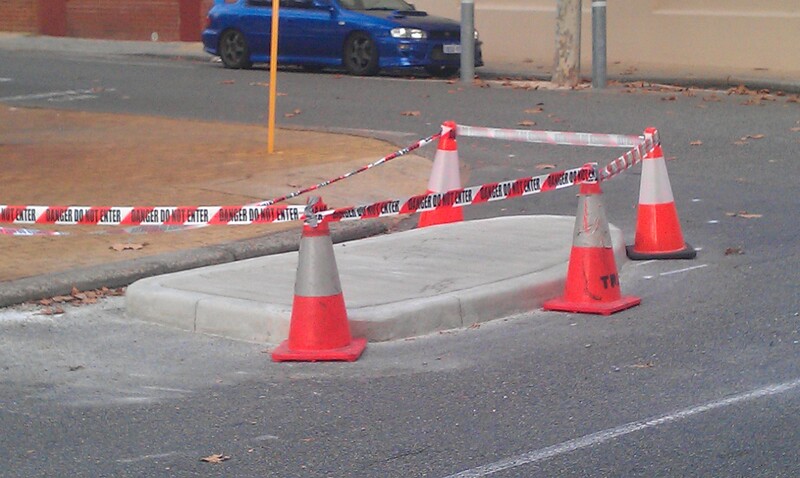 Here we see again Fremantle’s campaign to drive out cars, keep cars, their drivers and their cash out of Fremantle. Recently the Mayor Brad Pettitt was quoted that the proposed Perth freight link would cut Fremantle off from cars coming into the city hence crippling its economy. 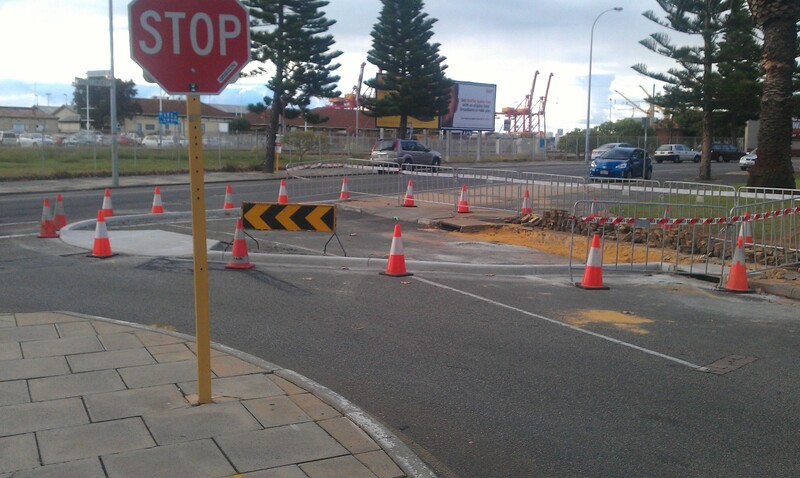 Sorry isn’t that what the Mayor and council having been doing for years, trying to keep cars out of Fremantle. They are doing their best to stop people in Fremantle even owning a car, as we saw from the city’s new car parking policy they just voted on at SGS. 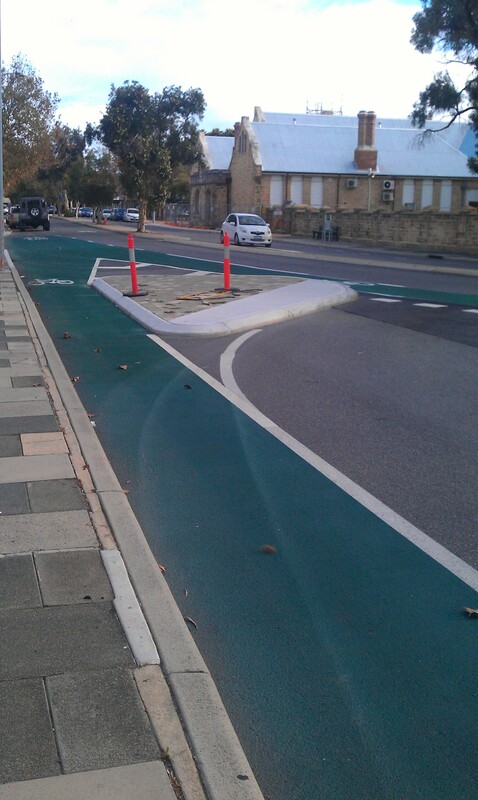 These pictures attached are one of the reasons why cars aren’t coming into Fremantle, its part of the anti-car campaign. This street and many others have worked fine for decades, this one with a pedestrian crossing just a 100m or so up the street supplies constant windows to give you an easy safe access out to do a right hand turn on to Phillimore St from Pakenham Sts, T-junction. The island just in front makes it harder to turn off Short St into Pakenham. Also making it more dangerous to turn onto Pakenham as now you have to pull into the lane of traffic heading north, which view is partially blocked by the building. Where as you can see from the google maps pic, before was a much safer and sensible design. Driving in Fremantle is not just a simple task of watching where traffic should be coming from but also watching for the cyclists and skateboarders riding on the wrong side of the road or the wrong way down a one way street. Here is a clear example of where the city change has made this intersection more dangerous. On Adelaide St another classic of their anti-car strategy that actually makes the design more dangerous for all road users, this gem I have already complained to the city about when it was 1st done. At the time I also pointed out that apart from the design being stupid and completely void of common sense has no warning signs for users of the street that a modified road layout is ahead. Now we see it littered with broken temporary road signs, no painted curbs or reflective signs to signal the hazard ahead. When you come around the corner from Parry St to turn left onto Adelaide St, you veer right so you can turn left, makes sense? To make it worse before it was a merging road, now you have to do a 90% turn to get out on the street, your wing mirrors being obsolete for this manoeuvre, so you must drive left while looking right. The other challenge I found on my first navigation of the road disaster was, I had a cyclist coming against the flow of traffic up the green lane towards my left, with a bus on my right, you can’t look 2 ways at once. 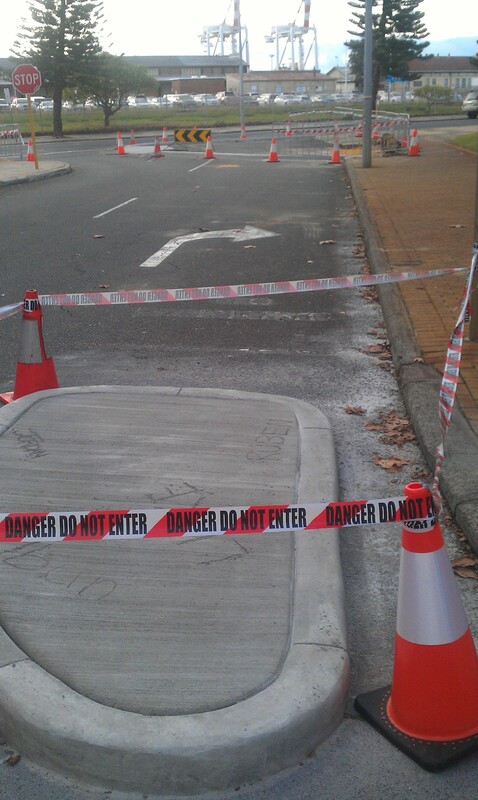 It’s all this constant road modification that makes driving in Fremantle more difficult and dangerous for all road users. It’s clearly just part of the anti-car campaign to discourage drivers from coming to town. So Brad, no need to worry about Barnett’s Freight Link killing off access to Freo, your constant screwing up of the road network and parking has beaten Barnett to the punch. After a decade of decline can’t they see their direction is not working, trying to pin Fremantle’s future outcome on Barnett is lame to say the least, for sure he hasn’t done us any favours but his road if and how or where it happens has no effect on the last decade of Fremantle’s Decline. The legacy Brad will leave is the Mayor who helped choke the life out of Fremantle with his councils anti-car ideology, you will regularly hear council say they are not anti-car, but their actions tell a different story? Plans to close streets to cars completely. This is not about being anti bikes, cycling should be encouraged as it adds another dimension to the city but not increased by driving out motor traffic. Where does Brad live in a small apartment or a big house, how many people live in it? Where does Brad park his car in Fremantle, who pays for his parking space who pays for his car? How many parking permits does the city hand out to its staff for free parking in the CBD? Its ok for them to drive cars, park in the CBD, but not for the rest of us, sounds pretty hypocritical to me. Fremantle Port Sale Could Cripple City’s Economy: Mayor,,,,,,,Seriously? The Barnett government’s plans to privatise the Fremantle Ports could drag the port city into an economic malaise it may never recover from warns, Fremantle mayor Brad Pettitt. Brad isn’t it a bit late to blame that on someone else? I thought Fremantle is in an economic malaise, retail is already pretty crippled as it is? Talk of selling the port crippling the city is petty scare mongering talk, especially when we have no idea what a new lessee of the port would do or bring to the table? Or what conditions would be placed on them by the government. Further to that the city had no real control of the plans the FPA had or has anyway, FPA are free to do as they will and currently do. Could the fear mongering be any more dramatic than with catches cries like “an economic malaise it may never recover from warns, Fremantle mayor Brad Pettitt.” Its seems the mayor is trying to build fear into our community, perhaps to aid in the councils plan to blow $100, 000.00 of ratepayers and residents on a politically motivated electioneering agenda either for his own profile or that of his council team running into the next round of local elections? Fremantle’s $100,000 Fighting Fund Deferred. The city over the last decade has been on a pretty much downward trend with no real light at the end of the tunnel. What also comes across as strange is a council and mayor that have been doing their best to drive cars out of Fremantle, are now complaining that the state government are putting in a bi-pass to make traveling past Fremantle by car quicker? I don’t see it making Fremantle any harder to get into. The council has been actively doing their best for years to achieve that for car users, with the selling of car parks, more road obstacles, talk of closing cars to streets, removing street parking which is like a cancer spreading across the CBD. Plans to drop the speed limit in the CBD to 10km/hr, another councillors drive to make the whole greater speed limit thru the suburbs city to 30km/hr. Crazy parking policies, for residents actively encouraging developers not to have sufficient parking in new developments, the list is endless. It is our current council and Mayor who have actively made Fremantle a harder place to drive into, park, and given Fremantle’s its anti-car image that is to blame for helping to cripple our CBD’s economy over the last decade. Now to point fingers at a port that may be sold, or a road that may be built, for causing Fremantle’s demise is quite laughable. If they want to see who has driven car users cash out of Fremantle look in the mirror, not now blame the State government for keeping cars out of Freo by roads that have not been built is ridiculous. Its just playing politics and a bit more state government bashing to cover the truth or misdirect blame and accountability of their own actions. The loss of places like Myers really drove the nail into the coffin for retail. Encouraging the homeless and street begging, encouraging graffiti, anti-social behaviour, drinking, drug issues with their go softly attitude or just plain ignoring the issues, actively has driven shoppers out of Fremantle, as we have seen retailers complain about in the press. We recently see an increase in police activity (More Cops) to start stamping down on these issues. About time, as lately we have seen a councillor criticizing the police for pulling up bike users for not following the road rules, a mayor who has actively criticized the police for the giving tickets to cyclists not complying with basic road rules. These actions all send a clear message don’t worry about the rules or law. A mayor who encourages graffiti vandalism. We’re Freo, we are above such mundane issues as the laws of WA, hence we have the issues we have. The city’s own strategic transport policy makes it hard for cars to get into, travel around, park and get out of Fremantle, now they blame the Perth Freight Link for doing what they have been trying to do for years, please? I pretty much think selling off assets to pay for today’s state government debt is pretty short sighted and bad for our long term future but I don’t think these arguments will go far with Barnett’s Boys. What is concerning is the councils current record of dealing with the state government to get positive outcomes for Freo (i.e. a tenant for Kings Sq DOH, shark nets, ocean pool, any real investment in Freo actually). Strangely the council is involved in the same activity as the Barnetts government by selling off city assets that are critical to the city future ie parking. Does that not strike anyone as hypocritical, perhaps Brad is going to run under a liberal flag for his run at state or federal politics? Do we really think they can hit the winning runs considering we are 9 wickets down in the last over needing 40 to win? Will they be able to get a more positive outcome on these issues or will their anti- government on everything ideology seal our fate? A concerning issue is that Mayor Brad pettitts comments that the new freight link will cut access to the CBD from the north and east. Now while I’m sure the mayor’s office has access to documents the average resident doesn’t, in all the plans I have seen for the Perth Freight link I have not seen one that cuts access to the old traffic bridge from Stirling Hwy. If this road is still operational how will it change access to the CBD from the north. As it has been a bottle neck for years? If no changes are made to Canning Hwy coming into Fremantle, as Stirling Hwy crosses it, how will that effect people coming into Freo’s CBD from the east? In any case the cities own transport policy doesn’t list Canning Hwy as a mayor or primary traffic link anyway. If Marmion Street is supposed to have an underpass or fly over how will that effect people travelling into Freo from the east? Apart from access to Freo from High St it seems pretty much as it was before. Which speaking of bottle necks is what happens as you cross over Ord St the carry on of Hampton Rd right now. Requesting a slip road off the new link onto the existing High St could solve this and would not be a big deal? If the traffic coming in and out of Fremantle was a concern for the Mayor Brad Pettitt you think he would think twice before trying to drastically increase density on thoroughfares like South St, which is already burdened at peak hours. This density will only make South St worse for congestion and more dangerous for users. As all of these residents will have cars, despite his fantasy ideas that an imaginary rail system down South St will take all these new residents to where they wish to go in the time they have, of course it won’t. I wonder if the city has had any professional independent traffic modelling done on these scenarios, especially as if High St is closed to the CBD, what impact will it have on South St as it gets an increase in traffic? If the city has plans or info they should make it available to the general public so we are as well informed as possible, to make our own decisions, as taking their word for it is a bit much to swallow, especially as we have seen how they handle community engagement information over major projects, the esplanade, J-shed, Kings Sq business plan, to name a few. Transparency is not a word you would use to describe them, not unless it started with “Lack Of”. It is clear their own political agendas are their primary focus. It’s starting to look like the mayors plans to revitalise the city of Fremantle have failed his “Lets finish what we started” campaign is looking more like “Let’s start what we talked about last time”? So now of course Fremantle’s future economic failure looks to be blamed on the state government not the councils last decade of failure. As we see in last weeks Herald the mayor Brad Pettit preparing his exit from local government as he looks to bigger and better things like state or federal government. I guess he needs to lay the blame on someone for the cities last decade of decline, so pointing it at Barnett’s government would certainly appear to suit his political agenda and appeal to certain groups in our community. For sure the state government has a lot to answer for the lack of focus on Fremantle, be it Liberal or Labor, but our council is front & centre on this issue. Perhaps instead of all the scaremongering being done by council they should approach this with a positive drive to ensure the best possible outcome is achieved by ensuring any road or tunnel has the best possible connections to get commuters in and out of the CBD. That of course would mean fixing the parking mess they the council and mayor created in town in the 1st place. If we get a more efficient road network in and out of town it could bring more people in then of course they would need somewhere to park. So fingers crossed if the state government puts a tunnel through under WGV or such to join the Roe Hwy connection, saving all of the homes on High St, Leach Hwy, saving all the trees by the golf course, what then will be the Mayors objection to the road, as his concerns of cutting off Freos’s CBD will not be relevant? I wonder where the Committee of Perth sits on this issue are they pro or anti Perth Freight Link?